I was able to test a pair out for a few weeks in the Fall on different rivers in the region. These shoes excel at climbing up and down slabs, or inclined rocks, which are common along many Maryland rivers. The shoe is lighter in weight than a shoe with a felt sole when hitting the trail for long hikes. Under the water’s surface the soft rubber grips the rocks, and without the studs, allow a totally quiet approach to the “fishy” spots. I also tested the Cloudveil 8x Stealth Boot on the Salmon River in New York while steelhead fishing. The shoe worked great in the slimy bottomed river, and along slushy, snowy trails. The Cloudveil lacing system secures the achilles heel and ankle area better than any wading shoe I’ve tried. 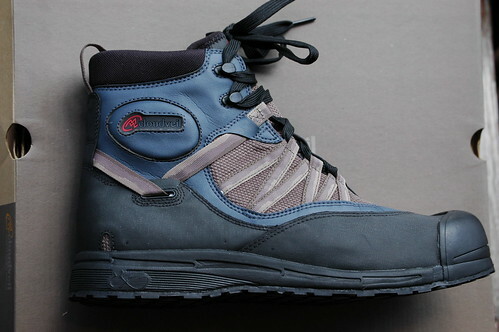 The synthetic fabric is lighter than leather and the toe of the boot features a large rubber toe bumper. I already owned a pair of Patagonia Sticky Rubber Riverwalkers, but the Cloudveils are the newest addition to my wading arsenal. The soles on both shoes are essentially the same concept, soft rubber with surface designs to aide in gripping rocks. The Cloudveil lacing system is a little different than Patagonia and provided a really snug fit. I plan to use one rubber soled pair exclusively on the Gunpowder river, along with an old set of waders, to help prevent the spread of aquatic invasives. Stop by the shop and try on a pair of these lightweight shoes. This entry was posted in gear, reviews on May 31, 2008 by Jason du Pont. Memorial Day Sulphurs on the Gunpowder River are Hatching–better Tivo the Indy 500! Unless you have a Fly-O, and are content casting indoors in front of the tube on such a glorious day, Tivo the Indy 500 and check out the Gunpowder. Flyfishing near DC has never been easier. Just point the car a bit North, drive about an hour and step in carefully among the 5, 030 fish wild fish per mile that inhabit the upper reaches of the Big Gunpowder Falls river and enjoy. The river is flowing at 110 Cfs, is gin clear, and water temps are 62-64 F throughout the catch and release section. Warmer water temps, created by spillover are making the insects and fish active. Higher flows earlier in the week did a good job of moving the Didymo out of some of our favorite nymphing runs. So nymph on! Try an unweighted pheasant tail nymph behind a Partridge and Green soft hackle and swing them through the riffle water if you dare. Sulphurs and caddis have been peeling off throughout the 7.6 mile Catch and Release section sporadically the past few days. Expect heavier concentrations of Sulphurs massing along the river dropping eggs a little closer to dusk. Spinner fall fishing can be very demanding and typically calls for lots of 7x tippet. We have great little biot-bodied Sulphur Para-spinners from Mike Bachkosky in stock that are truly easy on the eyes. Extended bodied CDC Sulphurs and foam-backed Rusty spinners are also worth a shot in sizes #14-16. This entry was posted in fishing report on May 25, 2008 by Theaux Le Gardeur. Thanks to Candus Thompson from the Baltimore Sun for her timely reporting on Didymo along the Gunpowder River. Alex Demetrich, from WJZ13 stopped in last week and spent some time in shop talking about invasives like Whirling disease and Didymo with Backwater Angler Staff members Theaux Le Gardeur and Jason du Pont. Later that night the information was broadcast during “The Environment” segment. I was out on the Gunpowder yesterday just above the Masemore Bridge and was quite surprised to see that many rocks along the stream bottom were completely covered with a slimy brown algal growth. In many spots, this appeared to cover the entire stream bed. My concern is what effect is this going to have on the fishery and also on the entire stream ecosystem. Will this destroy the upcoming generation of waterborne insects that require a healthy stream bottom to reproduce? Is this somehow related to the low flow we have seen during this winter or is this perhaps didymo which has been wreaking havoc on other river systems and destroying trout habitat? Is the area involved increasing in size? Can something be done about to remedy or curtail the situation before it spreads to involve the entirety of the watershed? Stay tuned and until then, fish on…and consider an Aquastealth shoe. This entry was posted in news on May 22, 2008 by Theaux Le Gardeur. They’re here! We’re celebrating the much anticipated arrival of the lightest and most versatile shoe Simms has offered in years. This new Simms Headwaters boot has an Aquastealth bottom. The upper is made of a NanoSphere, a Scholler technology that promotes easy cleaning. The shoe is an important option for fisherman concerned about spreading Didymo, (an invasive algae) and Whirling Disease Spores with ordinary felts. Coupled with Simms Hard Bite Studs, it’s a go-anywhere fly fishing boot. 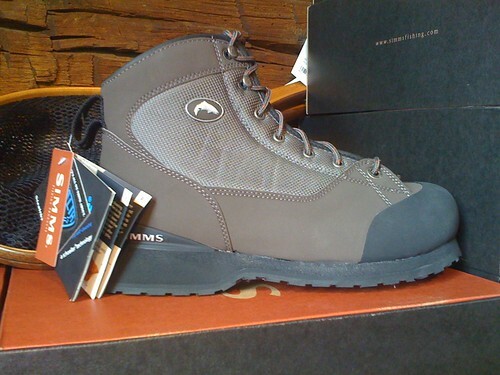 Buy a pair of Simms Headwater Aquastealth boots. This entry was posted in gear, Shop Online on May 22, 2008 by Theaux Le Gardeur. This entry was posted in fishing report, video on May 17, 2008 by Theaux Le Gardeur. I had a great day on the river. I landed over thirty fish and missed many more. Most were between 9-12 inches but I caught two that were around 15-16. I fished from the upper falls road lot and there were plenty of sulphers coming off between 2-5 however the fish were completely ignoring them in favor of caddis. Twice I saw fish come out of the water chasing a caddis that had just popped when there was a sulpher sitting on top within a few inches. The caddis kept coming off all day almost until I left around 8:30. I took all my fish on caddis emergers and elk hair caddis. Thanks for all your help. Just wanted to let you know I located and fished the riffles at the location you suggested. Caught 8 and lost an equal amount in about 2hours. All were Browns and decent size but 3 were exceptional. They were heavier than long with some shoulders. I would estimate the 3 to be in the 11-12 inch range and they had to be 3 pounders…real footballs. While all of them were able to strip line, these three actually made the reel sing…way too much fun. Good waterflow. This entry was posted in fishing report on May 15, 2008 by Theaux Le Gardeur. Please join us for a flyfishing school. 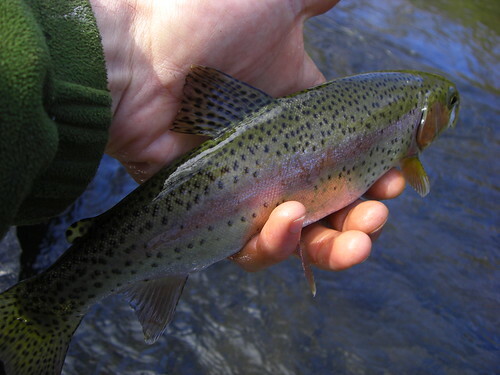 On Sunday, June 15, a Backwater Angler Guide will be teaching a fly fishing school that is ideal for beginners. If you’re planning on flyfishing Maryland, or anywhere else for that matter, this course is a great introduction to the sport. The school covers knots, casting, gear and fly selection. Class is held from 11:00 AM till 2:00 PM. Cost is $100 per person and includes the use of gear. Class size is limited to 4 and pre-registration is required. 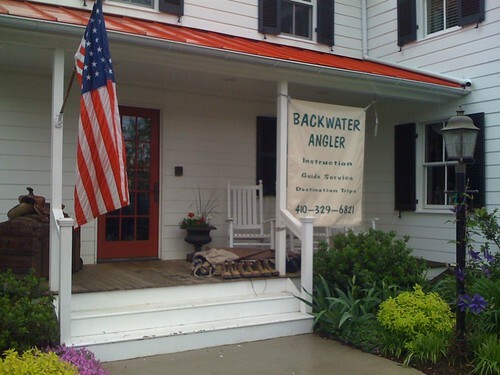 Please give us a call at 410-329-6821 or drop us a line at info@backwaterangler.com to pre-register. This entry was posted in events on May 13, 2008 by Theaux Le Gardeur. Didymo, an invasive algae, has been confirmed in the Gunpowder river. This video short describes distribution of Didymo, a description of the algae, and some gear treatment and containment methods for anglers. The increased time fishing and guiding on the Gunpowder River the past month only solidified my suspicions that something wasn’t right. Nymphing and swinging streamers still produced fish, but the increased frequency of cleaning “slime” off the hook was not normal. Many anglers and guides noted similar masses of slime on the hook and also the river bottom, throughout much of the catch and release areas. Fearing the worst I contacted MD Fisheries and boxed up samples of this strange algae. Days later MD DNR Fisheries Biologists contacted Backwater Angler, placed signs along Gunpowder River accesses, assessed the spread and posted a warning on the DNR freshwater fishing report. This entry was posted in fishing report, news, video on May 9, 2008 by Jason du Pont. After a good soaking throughout the area, the Gunpowder river is flowing at 41Cfs, water temps are in the mid 50’s and the river is clear. Early reports this week pointed to Sulphurs starting in the late afternoon followed by a Hendrickon spinner fall. have been encouraging anglers to get out and try their luck. The water is still quite low, even by Gunpowder standards so be sure to bring along some long leaders in the 12 ft range ending in 6 to 7x.If you’d like to start early, try small Elk Hair caddis with a partridge and yellow or green soft hackle dropper. Backwater Angler Guide Dave Smith has been tying up some local patterns this week so be sure to stop in this weekend and give’em a try. This entry was posted in fishing report on May 9, 2008 by Theaux Le Gardeur.